The conference tournaments are over. The selections are in. The show is on deck (6 p.m. ET, CBS). Get your blank brackets ready and pens out. And check out our final bracket projection right here. The battle for No. 1 seeds should be interesting because of all of the interplay among the top 6 teams and the injury issue with Zion Williamson. Big Ten tournament champion Michigan State is an unlikely No. 1 because their two losses to Indiana and their loss to Illinois are the three worst losses any team on the top two lines has. 1. Duke's win against Florida State for the ACC Tournament championship will result in the Blue Devils being the overall No. 1 seed in the NCAA Tournament. At full strength, Duke has been the best team in college basketball this season and the Blue Devils will be rewarded as such. 2. Virginia will also be a No. 1 seed -- likely No. 2 overall. 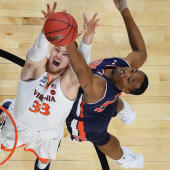 The Cavaliers were defeated by Florida State in the ACC Tournament semifinals on Friday. 3. North Carolina and Gonzaga should be the other two No. 1 seeds. Gonzaga is the only team to beat Duke while the Blue Devils were at full strength. The Tar Heels and Tennessee each have a win over the Bulldogs in non-conference play. 4. Tennessee's win against Kentucky opened the door for the Volunteers to possibly become a No. 1 seed, but the Volunteers' blowout loss to Auburn in the SEC championship game probably closes that door. 5. Any chance Michigan had of moving up a line is now for naught because of Michigan State's victory Sunday. Both teams likely were going to end up as No. 2 seeds regardless of the result. 6. Washington's late season slide concluded with a blowout loss to Oregon in the Pac-12 Tournament title game. The Ducks are now in the NCAA Tournament and stole a bid. In my bracket, the bid that was stolen belonged to UNC Greensboro. 7. My new last four in are Ohio State, TCU, St. John's and Arizona State. Washington is one spot safer than that group. So two of the last five teams in my bracket are from the Pac-12. Huskies fans will likely spend Sunday wondering if they will relive the nightmare of 2012, when Washington won the Pac-12 regular season title and missed the NCAA Tournament. 8. The new first four out are Creighton, UNC-Greensboro, Furman and Belmont. That will not make smaller conference fans happy if it happens. Selection Sunday starts with a busy schedule of the last conference tournaments, then is followed by the Selection Show on CBS at 6 p.m. ET. You can stream it here through March Madness Live, which will be your favorite app for the next three-plus weeks. In the meantime, CBS Sports HQ will have all the bracket insights, predictions and analysis you could need all morning, afternoon and night Sunday and throughout the tournament. Stream it free, live and with no sign-in necessary here.